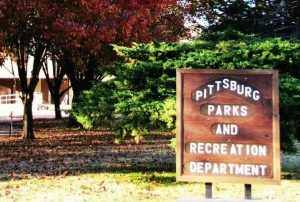 The City of Pittsburg Parks and Recreation Department is seeking candidates to fill two unexpired terms on the Parks and Recreation Advisory Board. Both positions were vacated after previous board members moved. Appointments will be made Tuesday, October 24, 2017, at the city commission meeting. Both terms will begin immediately with one term expiring December 31, 2018, and the other December 31, 2019. After the terms expire, candidates will be eligible to apply for a four-year term to the board. Application packets are available at the Parks and Recreation office at Lincoln Center, 710 W. 9th St., Pittsburg, or emailed upon request to kim.vogel@pittks.org. Application deadline is Tuesday, October 17, 2017. For more information, contact Director of Parks and Recreation Kim Vogel at (620) 231-8310.